Here is where it all began! On the very site of Ostrow Tumski, sometime in the 9th Century, the first permanent settlers of Wroclaw, the Slavic Slezan tribe, built their stronghold. In those days Ostrow Tumski was an island, and a perfect place to built the heart of a settlement, with the protection of the river Odra running around it. However, as far as its importance as the religious centre of Wroclaw is concerned, the date 1000AD is the key one. It was then, on the turn of the first millenium, that King Boleslaw the Brave earned the favour of Holy Roman Emperor Otto III and was able to establish a bishopric in Wroclaw. He chose to build a cathedral on this very promontory and the name Ostrow Tumski was born (literally 'Cathedral Island' in Old Polish). 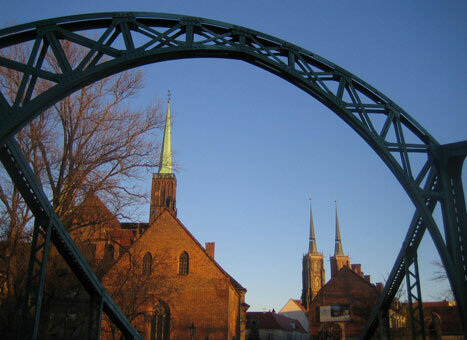 Ever since that day Cathedral Island has never ceased being the centre of religious life in Wroclaw - although it stopped being an island back in 1810, when a northern arm of the Odra was filled in. So what can today's visitor find on this hallowed, erstwhile isle? Well a little bit of peace and serenity for a start! This ground isn't only sacred, it is also very scenic and tranquil compared to the bustle of the Main Market Square. Ok, in the summer there is a buzz of respectful tourists in the air, but for most of the year this space is the sole reserve of strollers and the odd member of the faithful. Of course there's much more to do than just amble however, and top of the list of Cathedral Island's attractions is - needless to say - the cathedral itself. Named after John the Baptist, Patron Saint of Wroclaw, the current incarnation of the cathedral started life in 1241 although it's had a lot of restoration and augmentation done since then (just like every European church it has suffered a mandatory burning down or two and the odd bomb). Anyhow today you'll find the cathedral is pretty fine shape, and it's twin spires are the dominant feature of any self-respecting Wroclaw postcard. You can even take a lift up one of them for amazing views over the city! Another celebrated attraction on Ostrow Tumski is the Church of the Holy Cross. Actually there are two churches in one building, the other being St. Bartholomew's each having a separate main hall. The church's tall and lean structure make it another of Wroclaw's best buildings. Quite apart from the churches, there's other fine architecture to be enjoyed on the isle too. Well-maintained, classical-styled houses belonging to the Archdiocese of Wroclaw litter the main street, ul. Katedralna. Pop your head in if you can to discover some fantastic gardens at the rear of many of these edifices.